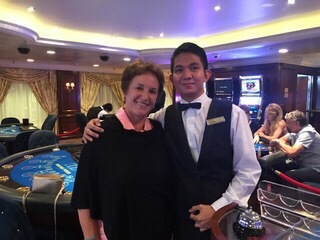 The evening before we arrived in Singapore, I had to say goodbye to Jessee, one of the casino dealers, who was leaving in Singapore. The casino is closed whenever we are in port, so this was the last time to wish him well as he goes home for 6 weeks then moves to Canada. All the best to you, Jessee – keep reading the blog. Maybe one day you will comment with your contact information! In spite of my teasing, I will miss you. 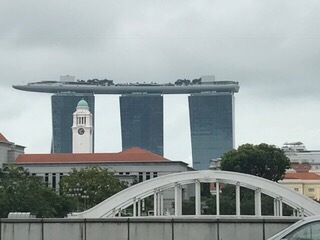 This is my fourth time to visit Singapore. For Norm, it was the third time. We have visited most of the places, eaten a lot of the food at the hawker stands and so this time we chose some different things to do. The Long Bar at Raffles Hotel was closed for renovation. I have been there but wanted Norm to experience the original (and most expensive) Singapore Sling. And it is the only place you don’t get fined for littering as you can throw peanut shells on the floor here. But, maybe next time. 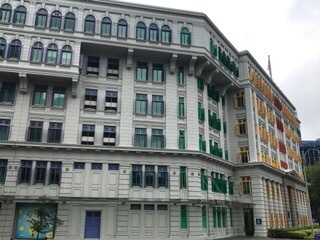 I was last here in April with Magda and Fiona from ICF as we met with and presented to the ICF Singapore group. 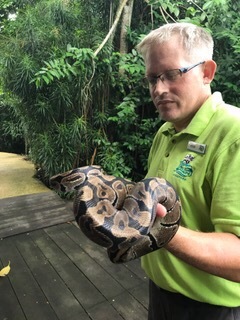 It was on that last visit that I met the person who was the ICF Singapore president, Hermann Ditzig. What a surprise to find out that he grew up only about 9 miles from me in New Jersey and in fact went to my rival high school, Hunterdon Central. We have developed a friendship and on this visit, we were invited by Hermann and his wife Phoenix (I had not met her last time) to their home for dinner. And what a treat it was for Norm to meet them, for us to spend time with them and their two delightful children and to eat the wonderful Vietnamese dinner that Phoenix prepared for us! We arrived in Singapore on Thursday, April 13 and the ship docked right next to two shopping malls. 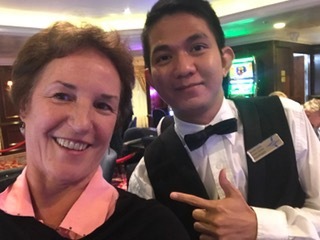 We had a few things to purchase, and we didn’t have any tours scheduled, so we did some walking, shopping and had lunch at Clark’s Quay on the water before heading back to the ship to get ready for our dinner at Hermann and Phoenix’s home. There are cameras everywhere and very little crime here. I am really hoping there are no cameras in the public toilets! Singapore is made up of 63 islands and has 5.75 million people. 76% are Chinese, 15% Malay, 8% Indian and the rest a mixture of other cultures. Most of the people are Buddhist. There is a large Chinatown, a Little India and Kampong Glam, an Arab area. Hate crimes are almost unknown. 1.6 million of the residents are not citizens. The city almost seems Westernized except for these areas of traditional culture. The foundation for Singapore’s prosperity was its designation as a tax-free port by Sir Stamford Raffles, who set up a British trading post here in 1819. It is now the world’s second largest shipping port. Every time you left and returned to the ship here, you went through immigration check and customs and we did have to have our passports, which, in most ports, they just keep on the ship. So there were a lot of lines as the ferry leaves from the same area and many people use it. We took their MRT during the day – a wonderful easy and clean subway system, but there is no train to where Hermann lives, so we allowed an hour to travel and planned to take a taxi. When we got to the taxi line, it was very long, so I summoned uber, and that worked very well, just like in the US. We had a good trip there even though it started to pour on the way. We enjoyed the evening so much, and said our goodbyes close to 9:30. 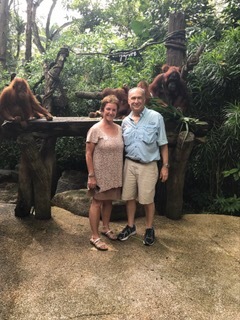 On Friday (which was a holiday here), we had plans with Alan and Beverly to have breakfast with the orangutans at the Singapore Zoo. 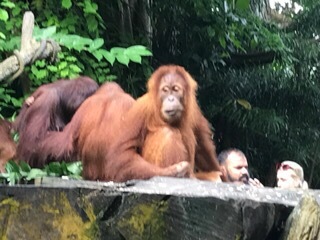 We had visited the zoo on a previous trip (and really loved the landscaping and the habitats) but had never done the breakfast. It was great – Alan and Beverly had been to it before so knew right where to sit to get the best view. The breakfast was American and Asian and I had dim sum and the noodle dishes, which I love any time of the day. 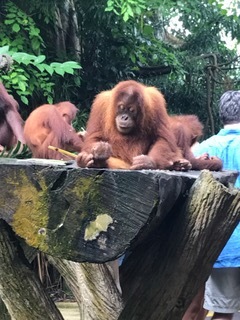 Toward the end of the breakfast, the trainers put a long log up to the habitats and the orangutans came down to the feeding platform. 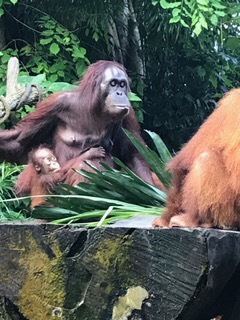 One had a very small baby. It was so much fun to watch them. Then we were able to go up and have photos taken. They say we share 98% of our DNA with them and it is uncanny how human they seem at times. After breakfast we stayed in the zoo and walked everywhere. It is quite beautiful. 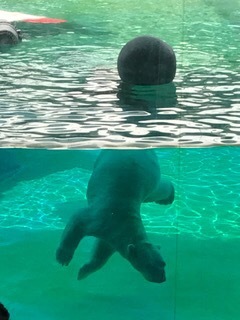 We saw the polar bear feeding, a great elephant show and lots of animals which I won’t list here. 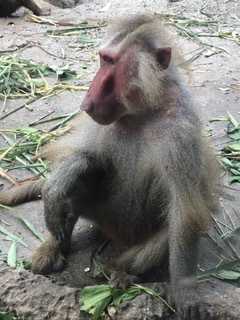 But I had to add this picture of a baboon, there were so many. It was a hot day and we left around 2:30 when it was getting very crowded with families – many children and strollers. 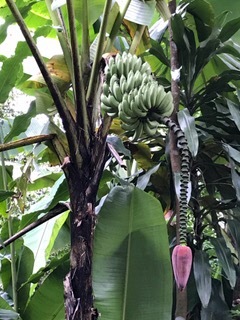 This banana plant caught my eye. We returned to the shopping mall and I bought a clamp attachment for my go pro camera. I wish I had it when we were in Ko Samui on the safari vehicle – a time lapse of the trip up those mountain roads would have been amazing. It was the change over day and there were about 450 new people on the ship. We had our lifeboat drill at 5:15 and again made it back to the ship in time for that and just as a huge downpour happened, and the rain kept up for several hours. Phuket Thailand is next after a sea day. This entry was posted in April, Asia, World Cruise 2. Bookmark the permalink. What a wonderful opportunity to meet with friends. Photos were fantastic. Enjoyed learning about the area. Enjoy! !